If there is one thing digital marketers want more of, it is success from their sites and marketing initiatives. Of course, no one likes declining sales trends or even the occurrence of just “bumping along.” Where do you look for guidance, though? The latest digital marketing book, SEO platform, or digital marketing tool? The secret typically lies in accessing the biggest hammer in your marketing tool bag, analytics! Understanding what interactions and behaviors are taking place on your site can provide a great amount of guidance as to what you may need to revise on your site to affect conversion rates. The first step in finding reason from the analytical data is realizing that your site users fall into several groups. First and foremost, converters and non-converters, but also several others such as by age group, new vs. returning user, mobile vs. desktop, and so on. Each of these user groups have different needs as well as perceptions of your site. It is up to you to identify there interactions and behavior and take more non-converters and transition them into the converters. Our analysis starts with setting custom dimensions. 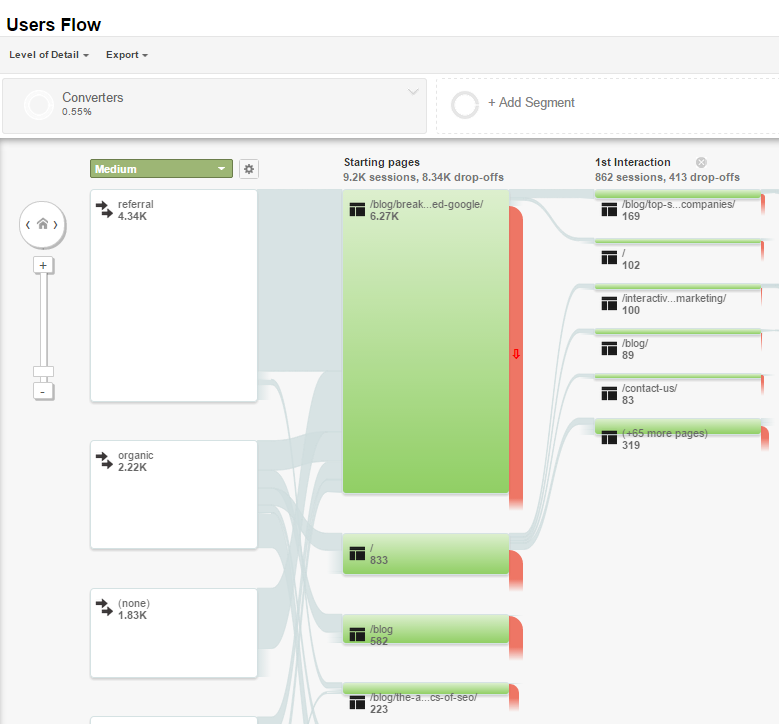 These analytical filters allow us to initially review two type of visitors, those who convert and those who don’t. For many of the sections below it will help to set these segments so you can see the differences between groups. Lucky for us, Google Analytics has predefined segments for converters and non-converters. Choosing only one segment at a time to view the following areas in Google Analytics. Review the typical user through the site by converter and non-converter. First, where does a converter typically enter the site and how many pages do they traverse before converting? Second, where does the non-converter typically enter the site and how many pages do they traverse before we notice a considerable exit rate/drop off. For the converters, is there a noticeable rhythm of great internal linking to keep them traveling through the conversion funnel from the starting point(page)? For non-converters, where are most people entering the site? Where we see the drop-off primarily happening, is there a lack of calls to action, links to related content, or confusion in navigational linking? While User Flow is a nifty visual for understand page progression and drop-off rates, Content Drilldown is an alternative data view for those a little more linearly inclined providing a table view for you to walk through top content pathways from within our custom segments. Now go your site and click through these pathways and gain an understanding of what may be providing reasons for users to leave the site. Now that we have a general understanding of overarching user flow behaviors of our converters vs. non-converters, we can likely start coming up with a little more insight on where we may be able to improve our conversation optimization efforts based on who these users are and where they are coming from. Since mobile traffic is all the rage these days and its contribution to overall site traffic is on the rise, let’s review our two segments within this analytical vertical. Does your percentage of conversions from mobile users compare with the percentage of overall mobile traffic which contributes to total site traffic? If mobile conversions are 2 percent of total conversions and 20 percent of overall traffic, you may have an issue. With our minds still surrounding the segmentation of converter and non-converter, let’s know look at demographic data. We understand how these two types are walking through the site, but who are they? By reviewing gender and age group data with secondary dimensions set to Landing Page, you can get a much better understanding of what demographic lens you need to wear when reviewing certain pages. To gain a better understanding of these underperforming demographics, create a custom segment based on this demographic and review User Flow or Content Drilldown to assess their entire journey through the site and where drop off is likely occurring. Do call to actions and internal linking on specific landing pages speak to the interests of that gender or age group? For example, your older female age group may be suffering a low conversion rate. If you are selling Osteoporosis supplements and internal linking on a major landing page for this segment to related articles and resources for sports related injuries, you aren’t providing enticing pathways to avoid site drop-offs. We have walked through site pages by converter and non-converter segment as they traversed the site but another angle to help assess is via reverse goal path. Of course we now walk away from having to segment by converter and non-converter, as we know that this view is only from those who have converted into said site objectives. In this section we will take a look at the conversion point and what pages recently provided the last few steps to conversion. This is where we will want to walk a few pages back in the conversion funnel and assess calls to action. We know what works and can now compare that with pages we saw earlier which were high drop off points. How can we revise the drop off pages to be more like these conversion funnel landmarks? 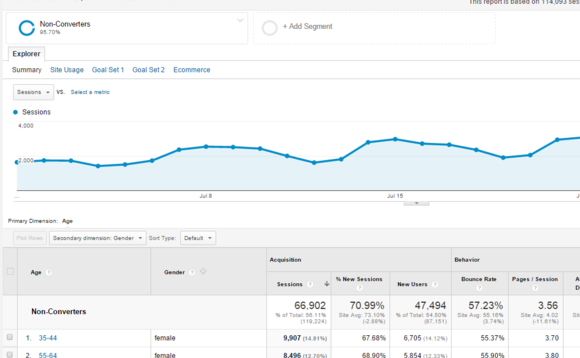 For those that have taken an analytical review of improving conversions before, this is one of the oldest methods of conversion optimization review provided by Google Analytics. We have walked through a few user types and their pathways through your site, but Funnel Visualization concentrates more so toward the latter part of the conversion process. Here, we can access drop-off issues in the final steps of the conversion process. If users are dropping out of the funnel but not exiting, what pages are they going to? Why are you providing links in the end conversion process to usher them away from the site? I think one of the most powerful advancements in Google Analytics over the past few years is multi- channel attribution. It has provided a great wealth of what channels work well together and helped marketers form the mindset that it isn’t just SEO, paid, social, etc. – these channels often times work together. A quick glance under the hood here can let you know a lot more goal information than a quick last touch by default goal attribution by medium view. For example, you may have seen an organic sales slide in the last few months and never realized that paid search is a channel that serves as a first touch point with the site and they return days later via organic. When you axed your paid search budget a few months back, it may be hurting you more than you think! The beautiful thing about Google Analytics is that there is still a myriad of comparative views we can undertake. We didn’t even take a look at obvious areas of review such as exit pages and sorting landing pages by bounce rate, etc. What I did want to do is provide a few fairly easy ways to review your conversion optimization potential utilizing deeper analytics offerings from Google Analytics via segmentation. The above will likely only take you a few hours to complete, but a few hours that could help you ramp up the conversion percentage of your site visitors.